Ed Castro is the president of a world wide online car club for neon cars called the 10th-Element car club (on the chemistery periodic table it is neon). His club specializes in the best and most unique show neons. Ed has been showing his car for the past 4 years at over 25 car shows a year, and his wife Kelly has been showing her pink neon for the past 2 years. New Pictures of Ed & Kelly's Cars with neon & LED car lights on them will be coming soon. 10th-Element was originally founded in 2002 by Robert Trinidad, and is now the online resource for the best of the best neon cars Worldwide. The idea was to create a team of owners from accross the Globe to share their new ideas with others, which is what has helped make the scene what it is today. Members of the club have accomplished great many tasks with their Chrysler neon cars such as appearing in magazines, television commercials and working with major companies in sponsorship programs. 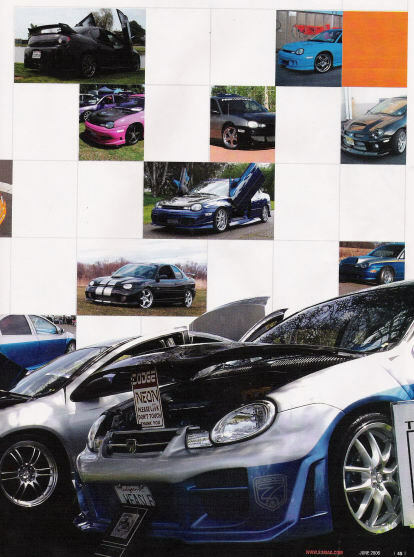 From the first generation Neon to the current SRT-4, members have taken their creativity and will power to make their show neons stand out and above from the rest. 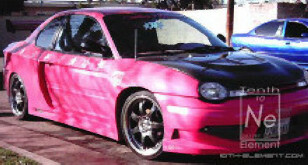 As you can see from the Dodge neon SRT 4 Picture Gallery, the integrity of the neon is as important as the mods to the cars. They constantly walk the fine line between a show stopping neon and a gaudy. They keep the integrity of the Neon/SRT-4 intact while pushing the limits of whats been done before. Recently, Ed & Kelly were interviewed and had a photo shoot done on their Neons by S3 Magazine, a car Tunning Mag. Below is a cut-out of their Magazine Spread. 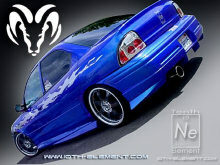 The future of 10th Element will include more motorsports as well as making our presence known at the car shows. Whatever we do we will always elevate our neon show cars by being one of a kind, show winning, headturning team. Stay with us as we follow Ed & Kelly to many of the major car shows through-out the year, and we hope you enjoy all the pictures we bring you of the neon cars from the events as they happen.